1 Place Rice, rinsed quinoa and boiling water in a saucepan and bring to the boil. Cover and simmer gently for 10 minutes. Stir, replace lid and stand for 2 minutes. 2 Stir through lime juice, sweet chilli sauce and ginger. Allow to cool slightly before refrigerating until cold. 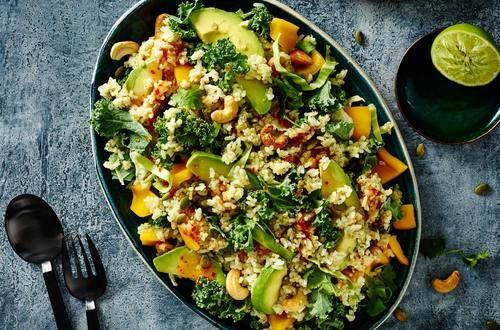 3 Layer rice, avocado, capsicum, kale, nuts, pepitas and coriander leaves into a serving bowl. 4 Delicious served with barbecued fish.